It has no name, and you couldn't buy it, and I guess as of now there's no "official" record that it exists. The Gold Crayboth is another in the ongoing series of these little guys, clocking in under 2-inches tall with 4 points of articulation. Its promotional nature means you flat-out could not buy one, it was in orders as a freebie if you were to get one at all. If you didn't order stuff on December 12, 2012 you probably had to go to the secondary market, and as far as I can tell Onell Design has made no posting on its own site indicating the item was produced. If you don't read reviews like this, or aren't engaged in the Glyos community, you probably won't even be aware it exists. 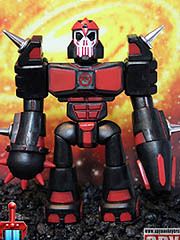 Bloodlust Umbreus (pictured) and Flaw the Obsidian Gohlem are $15 and $12, respectively. They will be joined by DX Close Combat Armory and Obsidian Close Combat Armory accessory packs for $5 and $3 respectively. This time around, the cool people behind Onell Design tossed in a clear red Infection Crayboth (name unofficial) in some/most/all of the orders! 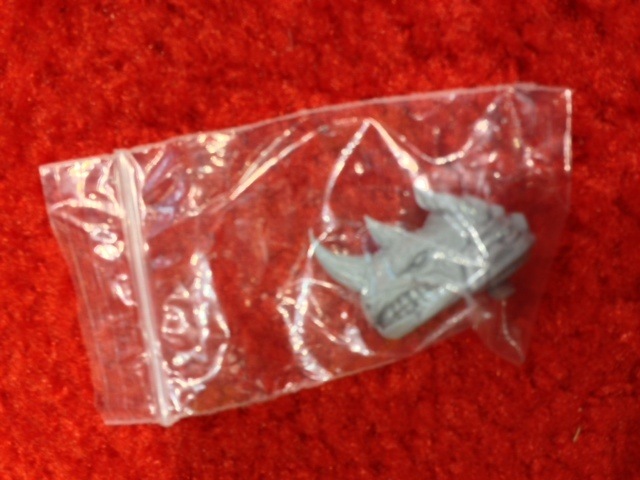 There was no sign of a grey Pheyden torso, a grey classic Pheyden head, or a grey scarf - if you found one of these in your order, please send a pic and let us know! We'd love to share it with the rest of the class. The other arrivals all look fantastic. Still available is the Reydurran Operations Unit Mini Blocker Rig, which I can tell you is slightly more stunning in person than in the pictures. If you think you might regret not buying one, go ahead and snag it. You have my permission. It's worth it. I don't have full details yet, but when has that stopped me before? 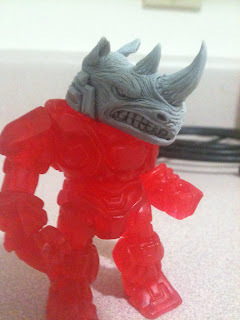 This awesome Rhino Glyos Armorvor head showed up on the October Toys forums courtesy of Talyn (image to the right). I'm reading it's on display and maybe up for grabs at The Godbeast's table at C2E2 and can be seen on the C2E2 exclusive Infection Armorvor body which debuts this weekend. It's awesome, and we hope to have more details as soon as I realize where I missed the announcement for them! UPDATE: Friend of the site (and good personal friend) Shaun Clayton was at C2E2 and confirmed these were on sale for $15 per. He was also kind enough to snag one (image below), so you'll be seeing more pictures of this awesome noggin pretty soon! 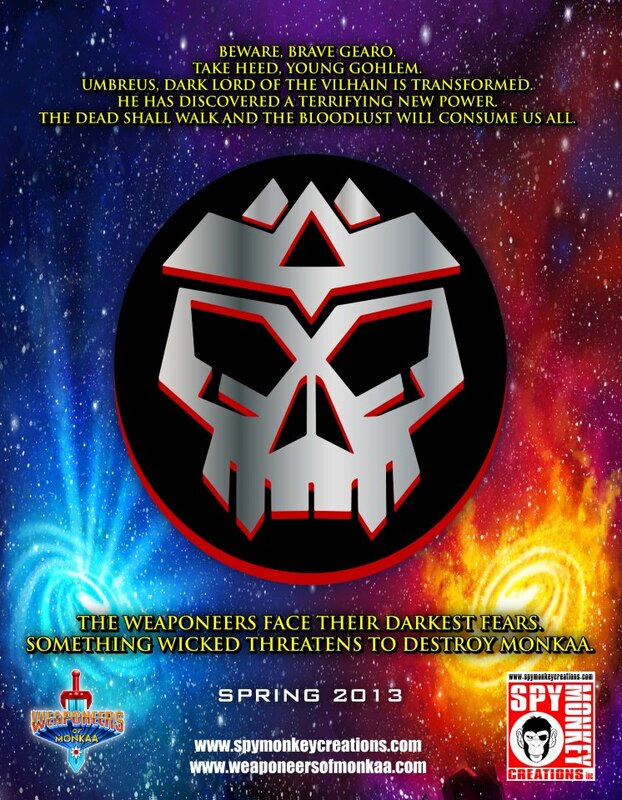 Behold the NiStuff Outlander as previewed by Internet Personality Vangelus! The human-like, Engineer-inspired head can be seen for the first time anywhere in this video at 1:16, so check that out. Nice scoop, Vangelus! The new figure looks fantastic - and no known release date has been teased just yet. 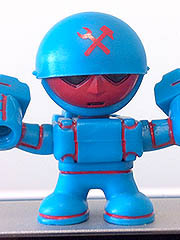 New Banimon Figure Preview - Blue! New from Banimon and previewed on the October Toys forums! While the figure has no specific name yet, it's blue and red and looks great. Click here to see a bigger picture, and keep an eye on the Banimon Blog for more as there hasn't been a post about this one just yet. Banimon Boston Comic Con Exclusives? "[Banimon] are getting ready for the Boston Comic Con this weekend. We don't have our booth number as of right now, but we do know that a few old friends will be stopping by: Jesse Moore, PJ Bartlett, Dr Rampageo and possibly another surprise visitor or two. There WILL BE some con exclusives, stuff that WILL NOT be part of our upcoming drop. Hope to see you all there." No pictures or hints were given, but oof, we are not close to Boston. If you're out there, buy an extra of... whatever it is for your online buddies, whoever they may be. They will thank you, I'm sure. New! Since last October's release of the first Weaponeers of Monkaa figures, people have wondered what's next, or when the next phase might start. The answer? Next week! 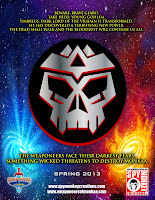 The story "Chronicle of Monkaa: The Bloodlust Tale" starts Monday, April 22 and the drop date for the next line-up is set for Friday... so this is an announcement of the announcement. Will there be new molds? New colors? New characters? Hopefully we'll find out everything within the next week. Let's run the menu! The Reydurran Divide drop menu is archived here, ready for your perusal. Items did not sell out instantly, although an all-red Glyan did swiftly sell out first. Other items sold down quickly, but most of the 24 new items were still available 30 minutes later. Two hours later, 15 of the 24 new items are still available so there's quite a bit to be had if you missed the drop's launch. All three colors of Swing Joints are still in stock, so if you were looking to get those it's not (necessarily) too late! 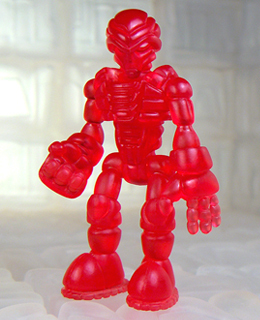 The Glyos Store has been updated right now, with a surprise - a clear red Infection Exellis! The Red Glyan is the first figure to go, with the Crayboth and Syclodoc seemingly next to sell out - if you're reading this during the few minute window, you'd better go grab them while you can. It looks like another night of sell-throughs is going to happen, so go ahead and order your figures or weep that you missed them. We'll print the full menu of available releases later this evening or early tomorrow. 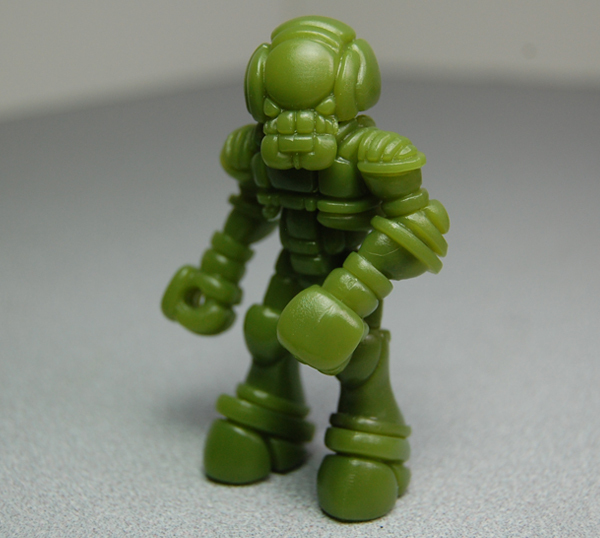 A new Glyos drop is coming! The Glyos Transmission Web Log (which I assume you follow) has all of The Reydurran Divide details, including TBD surprises, the superb REC Commander Sannuric Sarvos (pictured), and returning favorites like the Mini Blocker Rig, Syclodoc, Armorvor, and Crayboth. Oh, and Swing Joints in at least three different colors: red, grey, and black... the latter of which will be a mere three bucks. Exciting. Click here to go directly to his post with the menu of a ton of goodies. Or, failing that in some horrible future where this post may be all that survives of humanity, I've copied his menu below... but you'll still want to go to their site to read the commentary. Very important stuff, man. 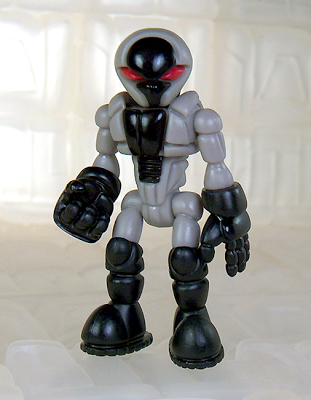 In 2013 we saw Glyos (especially Onell Design) meet and raise expectations of what you can do, often just with deco. Callgrim's Fragrarian figure manages to Out-Strawberry a certain Ms. Shortcake, while the Mordireus Sarvos out-pinks Barbie. If you've ever wondered if it were possible to make a figure so pink it goes around and becomes manly again, yeah, this is that figure. The new joints make a huge difference in the Glyan's ability to be posed, and I assume it's going to expand play avenues a great deal as well. I certainly can't wait to see more. 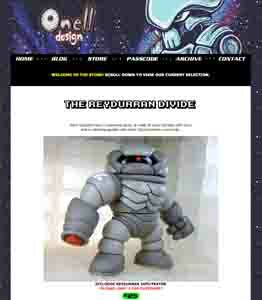 Several pictures of the 481 Universe NiStuff Outlander figure were posted over at 481Universe.com this week. Numerous clever flips and tweaks reveal several excellent alternate builds which give the figure a different personality, ranging from the more rounded head you see above to a two-legged creature he is tentatively calling the "hopper." A version with truncated Dorf-like legs and other builds are shown, but a release date remains elusive. You may as well click here to see the pictures while you wait. Good news, everyone! Boris of Banimon.com has posted some more stuff on his blog indicating new figures will be out soon. Why paraphrase, when we can plagiarize? "The next wave of production figures is in production, and should be dropping by the end of the month. As many of you know, we have subtly reworked the mold back in China, and the result is a sturdier trooper and one extra switch pin, which should make the builders out there happy. As always, the drop date will be announced once the figs have gotten here and been inspected, and once we've had a chance to coordinate schedules with the rest of the Glyos crew." Excellent stuff, indeed. Read more at his blog. MagFitch of IrregularBagel.com will be having a release tonight, according to a post on October Toys' forums. He promises new parts, new gear, and sale prices. But what? We'll let you know as soon as we have pictures! While you wait, check out his store for a look at some of his existing items. Numerous custom heads are available, plus other pieces to augment your Glyos collection. If you're in Chicago later this month for C2E2, you're going to want to get this TGB Customs 2013 C2E2 Exclusive Glyos Armorvor Infection action figure. Holy crap, I want one of these. The trading card art is by Nathan Newell, and are limited to 3 per customer. They're a cheap $10 per, so be sure to grab one and/or send your good friend to get one for you. It looks like some hand-cast heads of other creatures will be on hand as well, and as you know we're quite fond of those too. First teased about four months ago, Onell Design revealed its Swing Joints today with a pair of new postings. 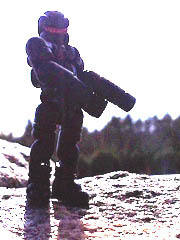 One, a silhouette of a Glyan with the joints which we heavily lightened to see that the figure seems to be black or purple plastic with a reddish visor and swing joints in both the arms and legs. It's pretty swell. The other posting shows test shots of the pieces in green plastic, giving us a pretty clear look at what these things are. Onell Design has yet to reveal how these will be sold, be it part of a figure or as an upgrade kit (or perhaps even both). 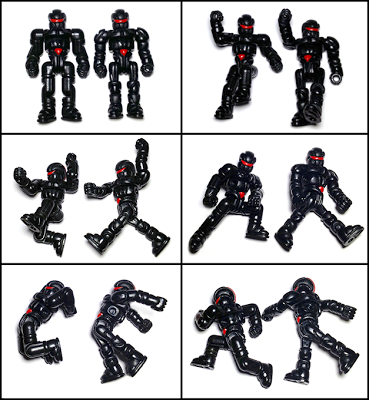 It expands the range of movement of these guys quite a bit, but also pushes them away from the very retro roots toward... well, even more retro roots given that Micronauts had this kind of movement. It should be an exciting release! An update of the long sold out Nebula Pheyden, Neo Nebula Pheyden is different enough to, hopefully, not make you mad. I missed Nebula Pheyden so I had to consult the archives at Onell Design for this, and this update makes sure that you can't easily pass it off as one of the originals. There really is no stopping Pheyden! If you pledge $25 or more on the OMFG Kickstarter, a Bonus Z.O.M.B.I.E. Pheyden Mini Figure will be included. So if you kick in $25, you get a flesh OMFG set, a black OMFG set, a black Pheyden, and a flesh Pheyden. Basically, you get one Pheyden for every OMFG Series 3 set you Kickstart. If that's the verb. 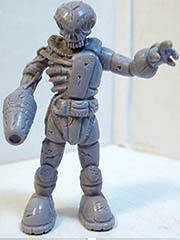 Zombie Pheyden was originally shown as part of Z.O.M.B.I.E. series 2 at Comic-Con last year in San Diego. According to the October Toys forums it seems unlikely the remaining figures will see production. To see Pheyden and the rest of series 2, click here.